MicroPlace: Invest wisely to help alleviate poverty. Target audience: Social change organizations, nonprofits, NGOs, students, educators, individuals. While there might be more noise in the social good space, there are also more tools to make giving easier and more accessible than ever. Many are also calling this a trend toward “democratizing social good.” The fact is, you don’t have to be a billionaire philanthropist to contribute to positive change in the world. Whether you want to start a movement, do something to give back or just share your story, here are some great platforms that are enabling different ways for people to participate and make a difference. 1Founded by Adam Ross, Socialvest marries shopping and giving together to make it easy for people to support their favorite causes by creating a fundraising channel out of everyday shopping. Then you can choose to donate the money you’ve accumulated to the charities or causes you care about and give the money you’ve earned through your SocialVest “Giving Account.” SocialVest also allows users to promote your cause via social networking and set up give groups and fundraising projects through social tools. 2Co-founded by Joe Green and Facebook’s Sean Parker, Causes is the app inside Facebook that lets people choose specific causes to mobilize their friends for collective action, spread the word and/or raise money. Since 2007, the app has been used by a community of 125 million people and has had more than $22 million donated through the application. 3DonorsChoose is a platform that connects donors with classrooms in need. Go on the site, choose the project that interests you and donate to a worthy project. The site delivers the materials to the class and in turn the students will send you thank you notes and photos of the impact made. 4With MicroPlace, for as little as $20, you can open an investment account, use their search tools to find an investment on their site, pay with PayPal or your bank account and then receive interest payments to make your money back. These socially responsible investments in microfinance can help alleviate global poverty, helping the billion people who live on less than $1 per day. 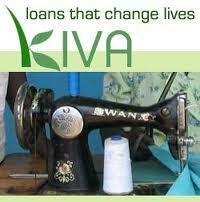 5Kiva has been a prime of example of online microfinancing, enabling people to give “loans that change lives.” As of Sept. 19, Kiva has distributed $160,822,200 in loans from 757,183 lenders. A total of 220,977 loans have been funded. Make a loan for as little as $25 to one of their deserving entrepreneurs, follow their progress and get your money back over time. 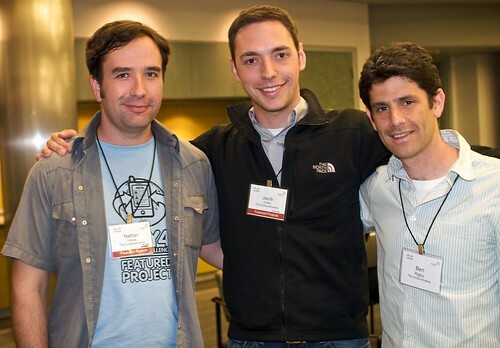 Nathan Freitas, Jacob Colker and Ben Rigby of the Extraordinaries at NetSquared 2009. The Bay Area-based Extraordinaires are among the social causes highlighted in the current issue of Time magazine in an article titled New Ways to Make a Difference. 1The Extraordinaries: The organization is helping to pioneer “micro-volunteering.” As co-founder Jacob Colker told us last week at Net Tuesday, only 26 percent of Americans volunteer — at all — in a given year. That’s partly because we lead super-busy lives. Beextra.org gives us a way to contribute bits and pieces of our spare time to do something worthy, from helping to add tags to museum archives to snapping water going to waste in San Diego. Got an iPhone? Look for an app called The Extraordinaries. 3Kinded.com promotes random acts of kindness. First, print a card at the Kindred site, then “do something nice for a stranger, like sharing an umbrella or helping carry luggage, and hand that person the card. The recipient can go online and note where the act of kindness took place and then pass the card along. It’s like Pay It Forward, with mapping features,” Time writes. 4AllforGood.org, a new aggregation site of volunteer opportunities that we wrote about three months ago, draws listings not only from traditional volunteer sites but also from Craigslist and Meetup. It also lets you share those opportunities with friends on social networks. The cause-filled life from JD Lasica on Vimeo. Sloane Berrent, who publishes TheCausemopolitan and blogs at LAist and GirlsinTech.net, talks about causes and building community in this 3 1/2-minute video interview. I caught up with her a few minutes after the LA tech scene session she co-moderated at South by Southwest 2009 in Austin; the session drew about 120 people. Sloane, who practices what she preaches, is heading to the Philippines as a @kiva fellow for 12 weeks. She’ll be at the Kiva fellows social Wednesday at 6:30 pm in San Francisco. She’s already a good way toward raising the $7,500 she needs for air fare, vaccinations, work vise, lodging, transportation and daily living costs — you can support her here.